Humans have been using salt to preserve and enhance the flavor of food for thousands of years. But excess sodium leads to high blood pressure (which can increase your risk for strokes, heart attacks and heart failure), increases your chance of debilitating kidney stones and weakens your bones (already a serious concern for women). The 2010 Dietary Guidelines for Americans recommend that you take in fewer than 2,300 milligrams of sodium daily — about one teaspoon. (Most Americans get twice that!) If you’re over 51, African American or have high blood pressure, diabetes or chronic kidney disease, you should get only 1,500 milligrams of sodium per day. But the reason we get so much sodium every day has a lot to do with all that added sodium that sneaks into the prepared foods we eat. Simply tossing that salt shaker into the garbage isn’t going to help as much as these five tips from Lisa M. Davis, Ph.D PA-C, C.N.S., L.D.N for reducing your daily intake. 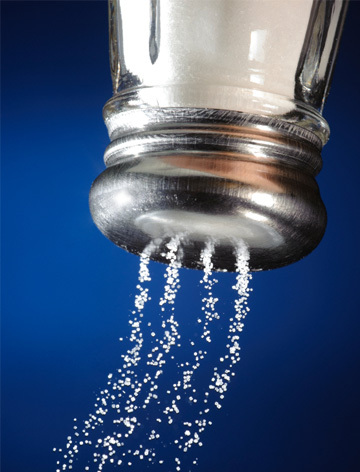 Many of the foods we eat every day are naturally high in sodium. Just a few simple substitutions will help you reduce your salt intake and may have other health benefits as well. Instead of butter or margarine, use canola or olive oil and you’ll not only reduce your sodium intake, you’ll also replace saturated or trans fats with more healthful types. Switch from creamy dressings to oil and vinegar-based options. Creamy dressings may have more than half your daily allowance of sodium per serving! As an added benefit, oil and vinegar-based dressings are usually lower in fat. Watch the meats you choose. Deli meats and sausages are usually higher in sodium (ham, beef, pastrami and salami can have up to 800 milligrams per 2-ounce serving!). Opt for grilled chicken or roasted turkey breast on sandwiches and leave the Canadian bacon in the refrigerator section and opt for turkey bacon instead. Speaking of sandwiches, try open-faced versions or look for low-sodium options for bread. Many breads contain up to 550 milligrams of sodium per slice! Some dishes just aren’t the same without cheese. But skip that sodium-laden American and opt for Swiss, cream cheese, mozzarella or cheddar and use them in moderation. You don’t have to skip dessert at every meal. But be smart about it. Instead of frosted cakes, pies, pastries, angel food and gingerbread, opt for fruit cake, apple strudel, custards or sponge cakes. When you’re cooking, add salt toward the end. This will allow you to use less salt but still get all the flavor. And don’t be fooled by the fact that sea salt sounds healthier; it’s about the same as regular salt in terms of sodium and may not contain that vital iodine fortification. 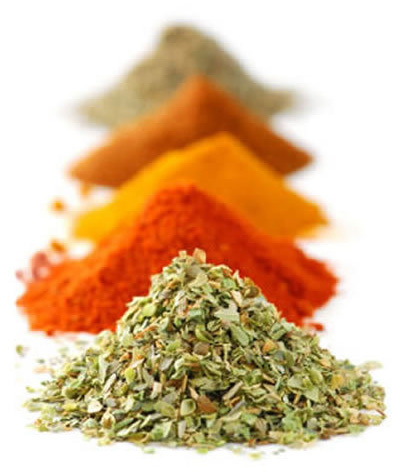 Instead, opt for other herbs and spices. Sage, rosemary, basil and oregano, for example, are very flavorful and have additional health benefits. You should also watch it with condiments like soy sauce and ketchup. A single tablespoon of soy sauce contains half your daily value of sodium. The same amount of ketchup packs 156 milligrams! Canned foods are typically high in sodium. After all, salt is a preservative. Skip canned soups altogether unless they’re the low-sodium versions and opt for the frozen (or better yet, fresh) varieties of veggies and fruits — organic is best. If you have to use vegetables or beans and legumes that come in a can, rinse them first to reduce the sodium contained in the juices they’re packed in. If you’re on a diet, you probably think you’re making healthy choices when you opt for lower-fat menu items at your favorite restaurant or skip lunch with the girls and heat up a reduced-fat frozen meal. But there may be a hidden threat. Many lower-fat options are higher in sodium (sometimes as much as two days’ worth!). Check the box or the restaurant’s website and look at all the nutrition info before ordering. Always read the labels. Some boxed cereals contain up to 1,000 milligrams per half cup serving. Hot cereals like oatmeal are a much better option. Also, when you’re checking those labels, don’t just check the daily value for sodium. Be on the lookout for these troublemakers in the ingredients, too. They all add to the sodium content of your food: monosodium glutamate (MSG), baking soda/powder, disodium phosphate, sodium alginate, sodium benzoate, sodium hydroxide, sodium nitrite, sodium propionate and sodium sulfite. You also need to know what you’re looking for. The FDA is pretty specific about what language is used on the box and it all means something very specific. Lisa M. Davis, Ph.D., PA-C, C.N.S., L.D.N. is the Director of Research and Development for Medifast. She holds a Ph.D. from Johns Hopkins University with a focus in obesity research, and she is currently the Director of Research and Development for the Medifast Program, a leading portion-controlled clinically proven weight loss program and co-author of the book, Anti-Inflammatory Foods for Health.